See what actual customers are saying about the Falcon Platform. *Critical Capabilities report; January 2018 Magic Quadrant for Endpoint Protection Platforms. 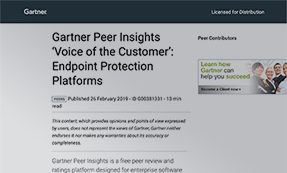 The GARTNER PEER INSIGHTS CUSTOMERS’ CHOICE badge is a trademark and service mark of Gartner, Inc., and/or its affiliates, and is used herein with permission. All rights reserved. Gartner Peer Insights Customers’ Choice constitute the subjective opinions of individual end-user reviews, ratings, and data applied against a documented methodology; they neither represent the views of, nor constitute an endorsement by, Gartner or its affiliates.